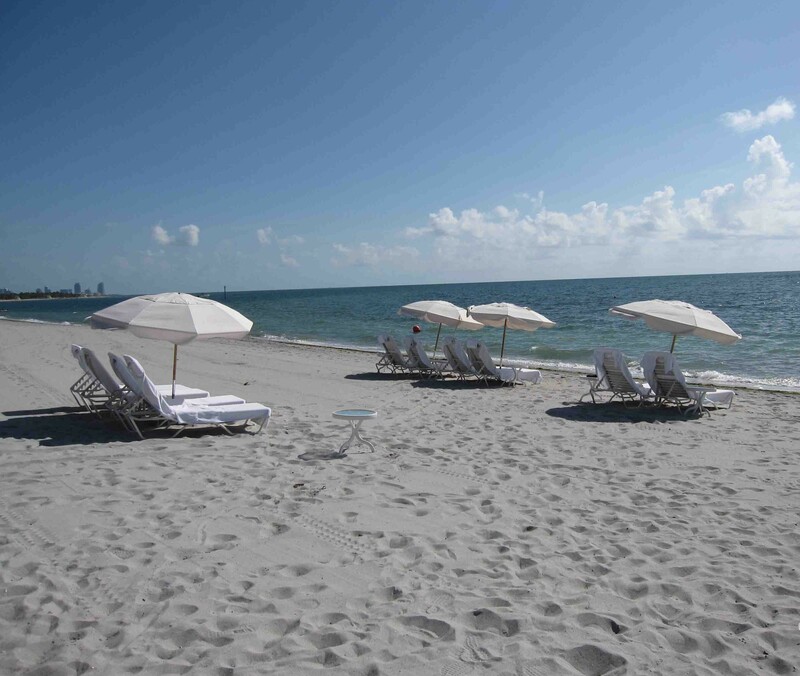 I recently spent 3 nights at the Ritz-Carlton Key Biscayne in Florida. Did you know that you can book vacation packages on the Ritz-Carlton website? I booked my flight and hotel as a package for considerably less than if I had bought them separately. The only drawback to this arrangement is that the reservation is paid in full at the time of booking and is non-refundable (however, travel insurance is an available option for purchase). I was emailed my travel documents; it was all very straightforward and easy. A short flight from Atlanta, a 30 minute taxi ride from Miami International Airport, and I was in Key Biscayne in no time. While my room was very nice and newly renovated, it was small and dark. No matter, I had come to Key Biscayne to be on the beach anyhow. The bathroom, by contrast was a very nice size with a separate shower and bathtub and nice bright, lighting. I had requested a balcony and received one; it had a “bay view”—the bay being way off in the distance—so it really was a view of the front of the hotel. Since I wasn’t in my room but to sleep, I didn’t sit on the balcony at all. 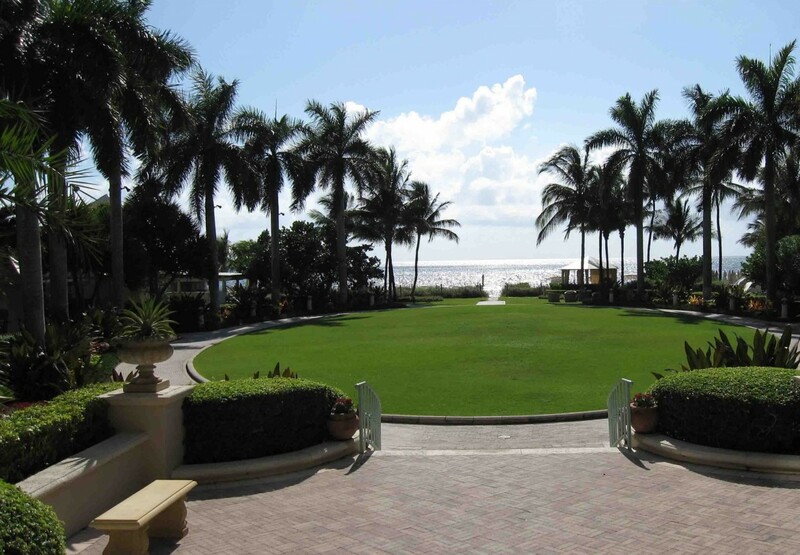 After checking out the hotel boutique, spa and various lounges, I made my way to the beach—just a short walk along the fountain, past the Great Lawn and pools. The beach is very narrow; there isn’t much room between the dunes and the water, but it’s very nicely kept. 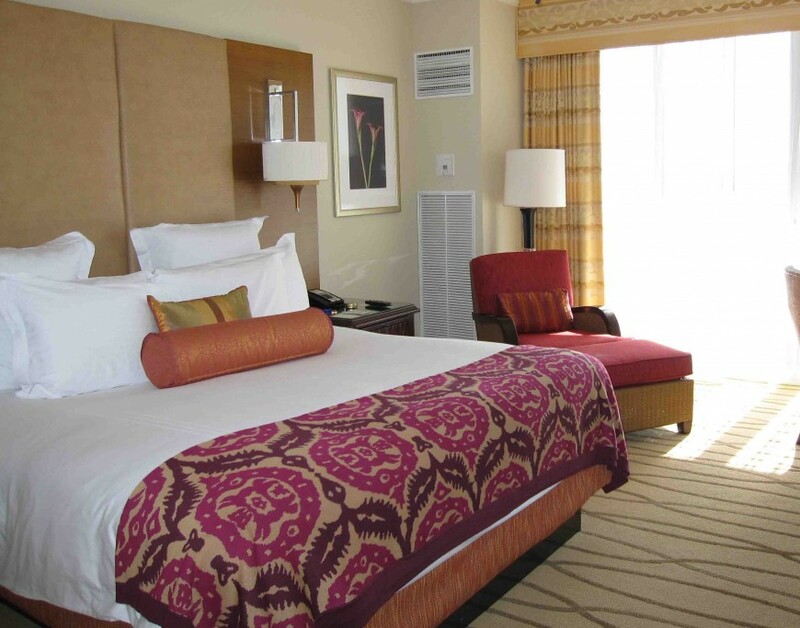 The Ritz hotel staff will set you up with a lounge chair and towels, while an umbrella could be rented for $20/day. I do think that the umbrella rental fee is very steep, but there was no way around it for me; I don’t like to bake in the sun. Although it was very hot in August, the beach breeze with the shade of the umbrella made for an enjoyable time outside. The ocean water was warm and shallow for a long time and the waves were gentle; there were many kids and adults in the ocean playing games and wading around. Both days of my stay I got the to beach in the morning and didn’t leave until the evening because I loved it so much. I mostly read a book and people-watched. The view, breeze and total beach experience compensated for the lack of great service by the Ritz beach employees; once they set up my chair and umbrella, I never saw them again. Preferring to spend my time on the beach, I didn’t use the pools at all; however I checked them out for future reference. The family pool has a waterfall; it was always full and families were having a ball. The adult pool on the other side of the Great Lawn was quiet and not very full at all. I don’t know why, but the hot tub was next to the family pool, so I never used that. But I did use the hot tub in the spa several times; the spa can be used by hotel guests, even by those not receiving a spa treatment. Like the other Ritz-Carlton spas that I have visited, this one was very nice and well appointed with a lounge area, hot tub, sauna, steam room, showers, locker room and all the toiletries that you could ever want. The cold cumber-laced towels are my favorite. I received a massage one day and while it wasn’t that great, the lounge area for awaiting treatments is worth the price of admission—cushy chaise lounges, tea, coffee and fruit—I could have stayed there all day. Although I didn’t use it, I toured the gym and concluded that my husband would have loved the weight area and cardio machines with televisions and complimentary headphones. Besides the beach and spa, I hung out in the hotel lobby lounge one night and listened to a Cuban band; they were great! Unfortunately, there was only one night of entertainment, so I would assume that guests looking for nightlife drive to Miami. Dune, a burger lounge, was pretty happening but it closed at sunset. 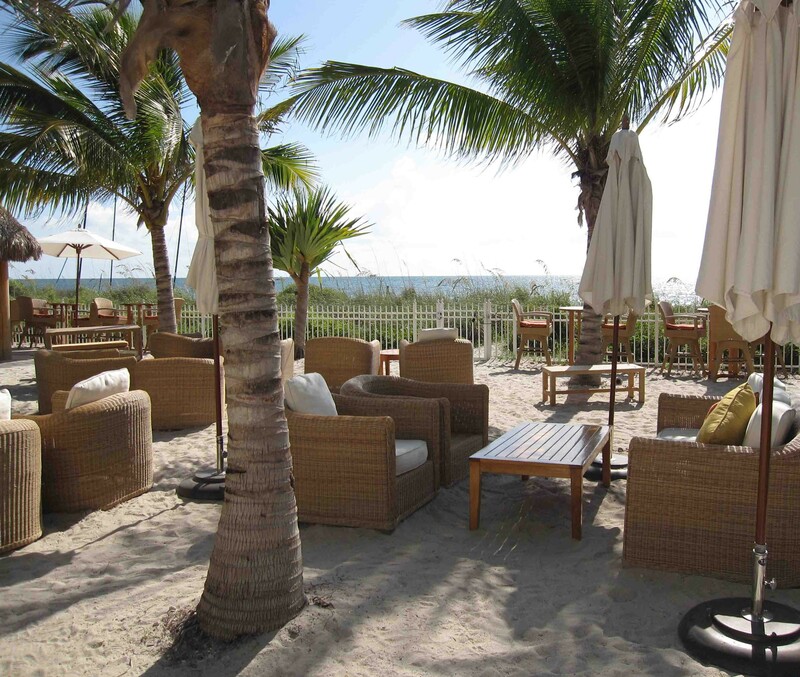 Located right on the beach, it was very groovy and also served a fantastic burger. I paid for the Club Level and I think it was worth it. Unlike the beach employees, the staff working the Club Lounge was fantastic. The continental breakfast was sufficient and very good; I ate breakfast every morning on the lounge balcony while reading The New York Times. Most days I brought sandwiches from the Club Lounge lunch display down to the beach with me. Sometimes I made the before-dinner appetizers my actual dinner and I never missed the dessert buffet. The lounge itself was very lovely and a nice place to read a book. But the real reason I loved the Club Lounge was the champagne that I had every evening! While the hotel had iffy customer service and it’s not as family-friendly as Amelia Island Ritz-Carlton, the location, beach, and hotel amenities makes me want to visit this Ritz-Carlton again either alone or with my family. With such a short flight and inexpensive last-minute fares from Atlanta to Miami, I’m sure that I will soon return. P.S. You may also like to read about more Ritz-Carlton reviews. Despite the service it sounds like a wonderful time. I love that you went by yourself to relax! Good for you! .-= Wifey´s last blog ..Married to a Football Fanatic =-.